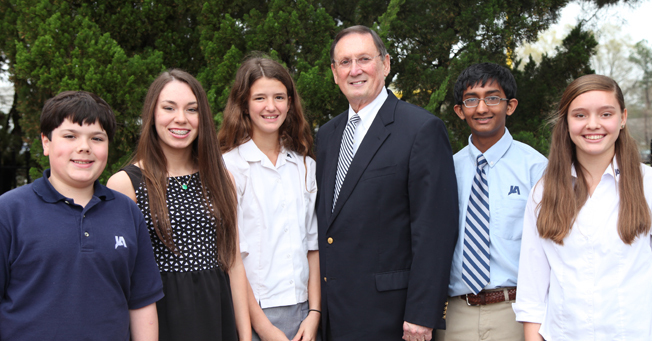 Jackson Academy has selected five students for the inaugural class of Jernberg Scholars. The JA Board of Trustees established the Jernberg Scholarship, which celebrates and awards academic excellence, in honor of President Emeritus Peter Jernberg who retired this past summer. The scholarships will become effective in the 2015-16 school year. Students were chosen from among a large group of highly qualified applicants who completed testing, essays, recommendations, and school and financial applications. Finalists completed on-campus interviews. Chosen for 2015-16 are Gracie Coe of Brandon, (sixth grade), Carter Elliott of Brandon (seventh grade), Columbia Holeman of Morton (Sand Hill) (eighth grade), Allie Perkins of Brandon (ninth grade), and Sahil Patel of Jackson (tenth grade). Gracie, Carter, Columbia, and Sahil are current JA students, and Allie will be coming to JA for 2015-16. In keeping with the influence Peter Jernberg has had on students and independent education in Mississippi and nationwide, the scholarships are designed to have a life-changing impact on the students receiving them. The students, likewise, will be individuals who will have an impact on their school through their focus on academics, character, and school participation. Qualified students may apply for the 2016-17 school year beginning September 15, 2015. More information is available here.